GTemCell supply a complete range of RF emission test equipment for EMC applications. Our AFJ FFT 3100 & 3300 EMI Receivers cover the full frequency range from 9kHz to 3GHz. To allow a greater flexibility GTemCell can provide either a single or multiple solution of receivers to cover the most common standards and regulations such as CISPR, EN, IEC, FCC etc. Conducted emissions, are due to the spurious current throughout a power unit harness, placed on the common power network. The conducted emission currents exciting the device, may affect other devices on the common power network through direct coupling. Conducted emissions may generate unwanted radiation. AFJ FFT 3010 EMI Receiver has been especially designed for conducted emission measurement, both during EUT diagnostic development and for final compliance tests. 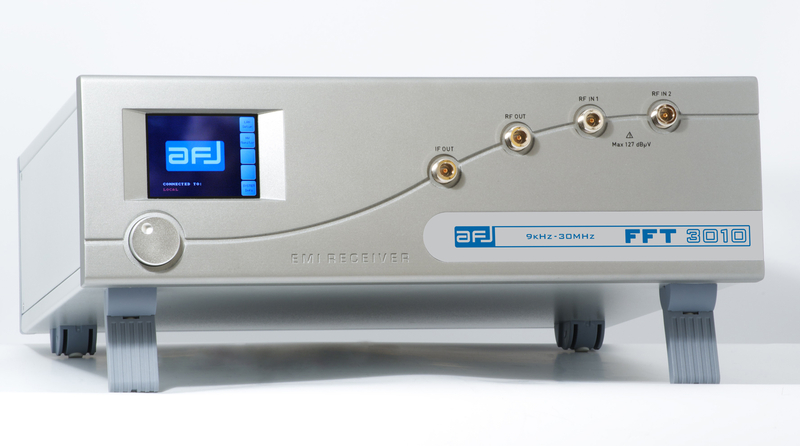 AFJ FFT 3000 is a Fully digital IF EMI receivers family, compact designed and manufactured compliant to CISPR 16 International Standard, using FFT Scan Mode for fast measurements of electromagnetic interference in accordance with requirements of EMI International, European and Product standards, pre-selectors and advanced software for EMC testing. FFT 3000 EMI receivers, cover the full frequency range from 9kHz to 3GHz, are based on a PC integrated architecture with WINDOWS 7 Embedded OS, so they are ready to operate with advanced software for EMC testing, fitted with pre-selectors that allow excellent dynamic range and precise emission measurements. Remote control with an external PC is also possible. Advanced software for EMC testing. CL55C is not just a GO/NO-GO tester, but it is a sophisticated analyzer fully supporting a thorough investigation on: when, where and why a click occurs. 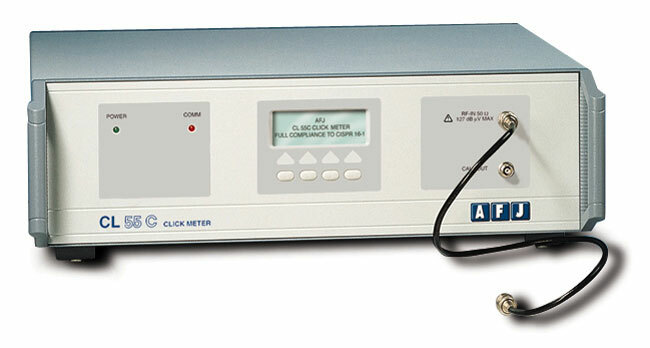 CL55C click analyzer provides for a very substantial contribution to problem-solving requirements, in a critical domain of the equipment compliance. The EUT whole cycle history, with markers and zoom functions, is available after the end of testing and the level-vs-time graph of both peak and quasi-peak detectors related to each event; can be displayed. The system includes a built-in impulse generator, fully compliant with CISPR 16-1-1, for self calibration purpose.